This is the craziest roundabout I have ever seen. And how is it able to defeat congestion problems? This is an actual roundabout in swindon(Britain)… it’s called a multi-mini roundabout and was designed in order to defeat congestion problems and lower the amount of accidents that were occurring when it was an unsafe, normal roundabout. 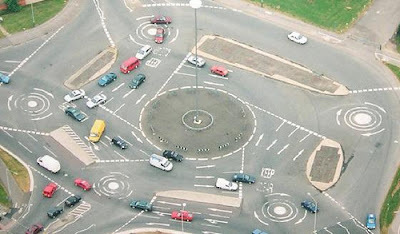 Hemel Hempstead also has a magic roundabout with 6 mini roundabouts in a circle. When I was learning to drive (many moons ago) my instructor took me round there at a stage in my learning where an ordinary roundabout was stressful enough! This is my home town and its easy and fun to get around. The fire station is even off one of the turnings. No matter how busy the roads get everyone moves all the time. You either use it like a normal roundabout and go clockwise or if you know it go into the middle and go anticlockwise..mad eh? Isn't it hard enough to figure out a regular roundabout? Why put dozens of spinning circles inside another circle. If given the chance, should try out the roundabout myself to feel what it’s like.